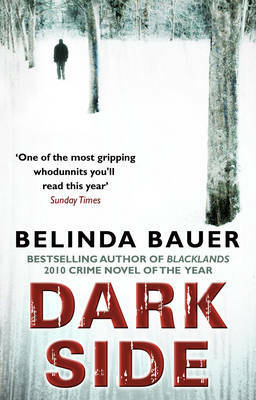 This is the second book by Belinda Bauer. Her first novel, BLACKLANDS won the CWA Gold Dagger for best crime novel of 2010, and I was looking forward to reading this new book. As with BLACKLANDS, DARKSIDE is again set in Exmoor. The main character is Jonas, a local policeman with the Avon and Somerset police, who is responsible for seven villages on Exmoor. He chose his job in the quiet backwaters of Exmoor, so that he could keep his job as a policeman and have time to look after his wife Lucy, who was been diagnosed with multiple sclerosis. It's a fairly straightforward existence as the 'local bobby'. However, his wife's health is deteriorating rapidly and at the start of the book Jonas appears to have rescued her in the nick of time from dying from a self-induced overdose. He clearly loves his wife very much and is scared of losing her. Shortly afterwards, a bedridden quadriplegic, Margaret Priddy, is killed by a stranger who breaks into her room and suffocates her with her own pillow. Margaret was a very active woman, who loved horse riding, but was seriously injured by a fall caused by a horse riding accident, and has been paralysed for some time. Just before she was murdered, she woke up to see a light, and believed gratefully that she was finally dying at last, before she realised that the light emanated from a torch, and was then suffocated. The suspicion that this could be murder brings in detectives from Taunton: DCI Marvel and his team. DCI Marvel is an extremely unpleasant character with numerous issues, but is keen to discover the murderer. He accuses Jonas of bumbling and excludes him from the team instead of using his local knowledge to help in the investigation. Jonas continues on with his routine, but finds a letter placed on his windscreen with the words 'call yourself a policeman?'. Not only does he wonder who put it there he starts to feel guilty that he's not done more to find out what happened to Margaret. After the second murder of an old woman with Alzheimer's and another note to Jonas, all the clues are in place for us to guess the identity of the murderer (if we hadn't already). But three more murders of old people in the home nearby follow, before the identity of the murder is actually revealed. I enjoyed this new book up to a point, but found that the story moved forward a touch too slowly to keep my interest, and the book was too long. In fact I'd guessed who the real perpetrator was fairly early on and feeling a bit bored I broke my cardinal rule of not reading the ending, to discover I was right. It's a small village after all, so not many possibilities. The ending is more unconventional for a book of this sort and sad to read. An interesting thread running through the story is the rather uneasy conundrum of whether the ageing people murdered are better off dead, due to their poor quality of life. Overall, I'd say that DARKSIDE is not quite as good as BLACKLANDS, but is still a reasonably good armchair crime novel. Read another review of DARKSIDE.